For a printer friendly PDF of this Client Bulletin, click here. With yesterday's election, pro-union politicians control both houses of Congress as well as the White House. President-elect Barack Obama and a significant majority of the new House and Senate have voiced strong support for the Employee Free Choice Act and liberalization of the NLRB processes and rules. Organized labor is already claiming victory and predicting a substantial increase in unionization efforts and successes throughout the country. The EFCA, whether its final version will include a "quickie" union election, card-check recognition, interest arbitration for collective bargaining, increased penalties for unfair labor practices or some combination of these, will truly be a game-changing law that will require new and innovative strategies for employers to remain union free. Don't wait until it's too late - Now is the time to get ready. Many of today's employees do not know what unions are, what they can and cannot do, and have never been exposed to what a union can and will do to the working environment. We recommend employers teach employees about these things before the unions' organizers do. The attorneys of Constangy, Brooks & Smith, LLP, have designed an EFCA-response program that will enable you to quickly implement a comprehensive labor relations strategy tailored to your workplace. This program includes proactive materials such as our labor relations checklist/audit, employee orientation materials, critical model policies, supervisor and employee training programs and educational videos, union-activity checklists and web-site templates as well as our emergency response kit designed to enable employers to immediately respond when an organizing effort begins. The game will change. Are you ready? 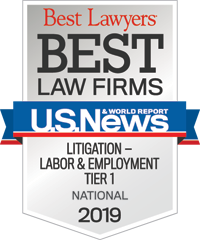 If you would like more information about Constangy's EFCA-response program and labor relations advice please contact Tim Davis at 816-472-6400 or Terry Clark at 336-721-1001, or the Constangy attorney of your choice.